ecoLife® Authentic Red Lentils are cultivated on family farms in India’s fertile, organic fields. Archaeological evidence shows that lentils were one of the first crops cultivated by mankind, and they have remained a staple in diets across the world as a source of fiber and protein. 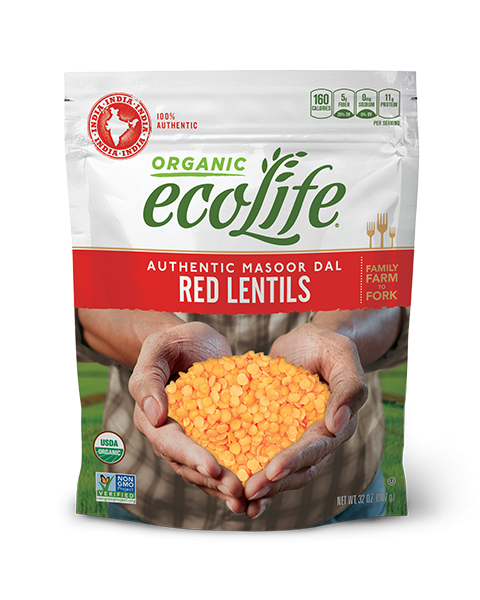 With their mild, sweet flavor and creamy texture when cooked, red lentils are the perfect base for soups, stews and curries. Sort, rinse and drain before cooking. For added flavor, add a pinch of salt or other herbs and spices before cooking. Combine 1 cup Red Lentils and 3 cups water in a saucepan. Bring to a boil. Reduce heat to a simmer (medium-low to medium), cover and cook for 20-25 minutes. Add more water if necessary to keep Red Lentils submerged. When done, Red Lentils should be tender and soft. Combine 1 cup Red Lentils and 3 cups water. Never fill cooker more than half full. Bring to pressure on high heat. Reduce heat to low, but keep under full pressure and cook for 10-12 minutes.